The cul-de-sac was a phenomenal invention for the suburbs. It created a safe and peaceful place for families to raise children. No one passed through. In fact, the only time strangers can appear is after a wrong turn and they find themselves at the dead end. The design made it simple for those who don’t belong to quickly turn around. It also kept everyone who belonged there in one place. Once you came in, you didn’t have to leave. You could remain the rest of your days with likeminded folks, playing games in your asphalt sanctuary. The cul-de-sac is the epitome of the suburban life and vaues. 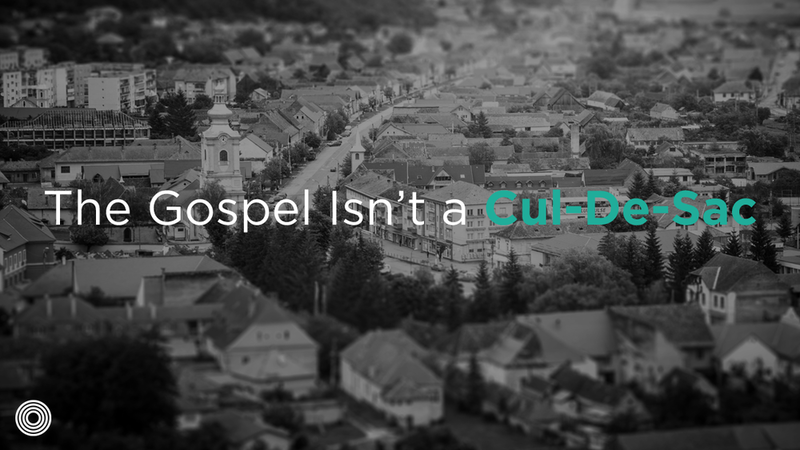 However, the gospel is not a cul-de-sac. It isn’t a safe sanctuary that separates you from the dangers of the world—it throws you into the world. It isn’t your private enclave to secure your values and doctrines. It ushers you into a hospitality for the other—the not like you. The gospel is doctrinal, changing what we believe. It also is personal, changing who we are. But it is more than that. THE GOSPEL IS MISSIONAL: IT CHANGES WHERE & HOW WE LIVE. If we just focus on the doctrinal and personal aspect of the gospel, we will neglect its missional aspect. If the doctrinal gospel changes what we believe, and the personal gospel changes who we are, then the missional gospel changes where we live and what we say. It is the hopeful announcement that God is making all things new in Christ Jesus! The gospel ushers us into a new kingdom and new world. We no longer live in a world dominated by death and deconstruction but one of life and re-creation! The gospel changes everything. It is not only good news for us, but also for our neighbors, the poor, our city, and the world. It affects the social, cultural, and physical fabric of the universe. In Luke 4, Jesus preached the gospel to the poor, marginalized, and oppressed. It is good news for them because through his death and resurrection he has defeated sin, death, and evil (1 Jn. 2:13; 3:8). The gospel announces the in-breaking reign of Jesus, which is in the process of reversing the order of things. The poor become rich, the captives are freed, and the old become new. Those who follow Jesus join his mission by making disciples of all ethnic groups by going, teaching, and baptizing (Matt. 28:18-20). We are sent to teach, speak, counsel, discuss, and proclaim the gospel to others so that they might be baptized into God’s new creation and join his mission of making all things new. We are called “ambassadors of reconciliation” and given the privilege of sharing in Jesus’ ministry of reconciling the world to himself (2 Cor. 5:17-20). Those who have been changed by the gospel share its life-changing power with others. We should announce and embody the good news by caring for the poor and rebuilding cities (Is. 61:4). In fact, the future for the people of God is an entirely new city in a new creation (Rev. 21). The church should be a movie trailer of this grand, coming attraction, when all things will be made new! The result of the church—you, us—being sent is that we live as a community of disciples—not only devoted to Jesus and to one another—but devoted to our neighbors and our city, too. When we come to Christ, we are all sent on his mission. We live on mission because we have received the gospel. We live on mission because we are messengers of the gospel. He is making his appeal to the world through us. We live on mission because we are ministers of reconciliation—servants of the gospel. We live on mission because we are ambassadors—representatives of the gospel. This coming Halloween offers a great opportunity for many to engage in new relationships with those around us or to revisit some old relationships with new missional intentionality. Regardless of what you think of the holiday and it’s roots, the culture we have been sent by Jesus to reach is going to celebrate Halloween. We all have in front of us a wide open door for missionary engagement in our neighborhoods. I want to encourage you not to miss out on the opportunity. If you are looking to be more intentionally engaged this year, I want to present you with a few ideas for how you can more effectively walk through the open door that Halloween presents to us as Jesus’ missionaries. Please, don’t give out tracks or toothbrushes or pennies…kids are looking for the master loot of candy. Put yourself in their shoes. Consider having some Hot Apple Cider and pumpkin bread or muffins out for the parents who are bringing their little kiddos around the block. Make your entry-way inviting so they want to come closer and hang for a bit if possible. Don’t hide out all night. Come out to the door or hang out on the porch and if they stop to have some cider, get to know their names and where they live in the neighborhood. Tell the kids you love their costumes and to have a great night. Practice building others up with words. If you’re really into it, you may want to throw a pre-Trick or Treating party. Provide dinner and drinks. Then, send the dads out trick or treating with the kids while the moms continue hanging with some hot apple cider, coffee or tea. Then reconvene with the parents and kids together to examine all of the loot (kids love to show their parents and other kids the loot). If you are out Trick or Treating with the kiddos or staying back with the other parents, ask questions…get to know their stories. Pay attention to their hearts and their felt needs. Look for opportunities to serve them later. This is how I first got to know Clay (while Jayne was hanging with Kristi and the other moms). I learned his story while we were with the kids and Jayne got to know hers. This led to both of them eventually coming to faith in Jesus. If others are throwing parties, you may want to join them. If so, bring drinks, food or whatever is needed. Then, serve by helping to clean up. If your community has key events, join them and invite some neighbors to go with you (then get to know their stories along the way). Our area has a trick or treating event on a main street where all the businesses give out candy, the firemen give tours of the fire engines, etc. We go with a group of friends to this each year and consistently meet more people to reach out to. If you do not have kids or are not going to engage in the Trick or Treating activities or events, consider going to the local pubs, restaurants or clubs near you for their events and get to know the people there. Make it your goal to learn the story of at least one person who needs Jesus and walk away with some next steps on how to serve them. You will want to do this with others so that you don’t go it alone. Ask the Spirit to open your eyes and ears to the real needs around you. Ask the Spirit to help you listen, care and serve those around you. Halloween: Trick, Treat, or Missional?